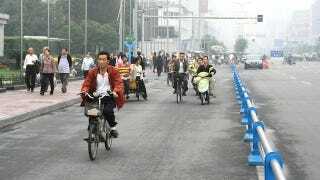 Electric bikes are going to be banned in Shenzen, China on July 1st because they're too quiet. Seriously. According to China, electric bikes are said to have caused more than 15% of accidents resulting in 64 people dead and 233 injured. Wtf? If you've ever been to China and hell, even if you haven't, you'd know that there's an uncountable amount of people there. And all those people have to get around somehow! The bulk of people use regular bicycles (which are fine, just not as fast) and many more are starting to use cars (which with the sheer number of people, is going to rage hell on the environment and traffic). Electric bikes existed in some sort of bizarro purgatory—it was a great compromise but with so many accidents, the silence of electric bikes was beginning to be viewed as dangerous.